The team of astronomers, led by Hagai Perets, now at the Harvard-Smithsonian Center for Astrophysics, and Avishay Gal-Yam of the Weizmann Institute of Science in Rehovot, Israel, presents evidence that the original star was a low-mass white dwarf stealing helium from a binary companion until the temperature and pressure ignited a thermonuclear explosion – a massive fusion bomb – that blew off at least the outer layers of the star and perhaps obliterated the entire star. 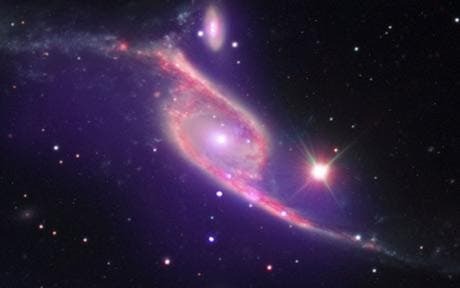 It was SN 2005E, which went off about 110 million years ago in the spiral galaxy NGC 1032 in the constellation Cetus, that initially drew the attention of Perets, Gal-Yam and their colleagues. Using data provided by Filippenko and Li, as well as by the W. M. Keck Observatory in Hawaii, the Palomar Observatory in Los Angeles and the Liverpool Observatory in the United Kingdom (U.K.), they created a detailed picture of the explosion. The small amount of mass ejected in the explosion, estimated at 30 percent the mass of our sun, and the fact that the galaxy in which the explosion occurred was old with few hot, giant stars, led them to the conclusion that a low-mass white dwarf was involved. right now, if you'll pardon the pun," joked Filippenko. "Many supernovae with peculiar new properties have been found, pointing to a greater richness in the physical mechanisms by which nature chooses to explode stars."